The IPS, or Investment Policy Statement, is one of the key parts of a comprehensive financial plan. It bridges the gap between the plan framework and the investment portfolio, and it outlines the critical factors considered in designing your portfolio. Provide more detailed information about the IPS as well as our investment approach and the risk and return expectations for various target allocations. This information is covered in a piece entitled Understanding Your Investment Policy Statement, which we will send out with the revised IPS. Allow for some flexibility in terms of allocation to the various asset classes. We do this by establishing a baseline percentage for an allocation to an asset class – 10%, for example – and then allowing for a tolerance band around that baseline percentage (e.g. +/- 3%). The change to the IPS format is just that – a change to the IPS – and not a change to our investment approach or the factors outlined in your individual IPS. We will be sending out the revised IPSs in the next few weeks, but if you have any questions in the interim, please don’t hesitate to contact us. One of the cornerstones of investing is the idea of diversification. More specifically, modern portfolio theory posits that by investing in a diverse group of assets that aren’t perfectly correlated, an investor can achieve the same level of return but at a lower risk. Lower risk is key, partly because watching portfolio values bounce around is unsettling, but it’s also important because the lower the risk (I’m using this synonymously with volatility), the lower the return to the investor. In fact, diversification is often referred to within the investment industry as a “free lunch,” because typically risk and return go hand-in-hand and it’s not possible to decrease one without the other. Diversification become challenging, however, when one asset class outperforms others over time. That was the case in the mid to late 90s, when large cap growth stocks outperformed just about all other asset classes — right up to the point that investors decided that speculating in bad ideas just because they had a .com at the end of their name wasn’t a good long term strategy. After that crash, as the chart below shows*, international stocks handily outperformed U.S. stocks for nearly 5 years, and that trend reversed in 2008. 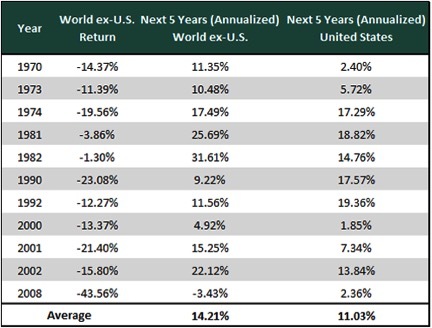 Thus, overall portfolio returns have been held back by the international stake, particularly when compared to returns in large cap U.S. stocks. Nevertheless, if we look to history, in most periods following a calendar year loss, international stocks have rebounded strongly in the subsequent five years. 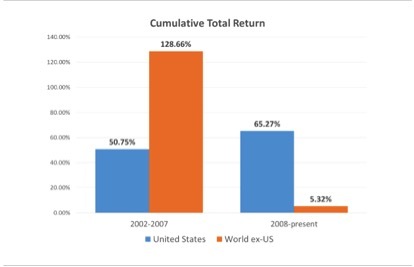 As the chart below shows*, international returns in most of those periods outpaced domestic returns. When the return pattern reverses is anyone’s guess, but history clearly shows that asset classes revert to their mean long-term return over time. When that happens, international stock returns will likely outpace their U.S. counterparts and be key in achieving portfolio returns in line with plan targets. * Charts from Assesing an Allocation to Global Stocks by Peter Lazaroff, CFA, CFP. Article appeared in Enterprising Investor blog from the CFA Institute.